I've told you so many times, you have to rhizome prune every year! When you don't, you get "problems". After losing power for about 20 hours after yesterday's intense storms (crazy winds, torrential rain, hail) things are almost back to normal here, although I'm not sure what normal is now. You've probably noticed that my posts are not as reliable as usual, and I apologize for that. Today's vignette is brought to you by Anna at Flutter and Hum, and is a mess. Literally, I just took photos of the mess that is my driveway. Springtime plant drag outs (from the basement and garage) are almost complete but nothing has been put into place yet... so it's a battlefield out there! It seems that I'm trying a new type of mulch this year. It was really easy to apply, and the price was right: free! The strangest thing is it's one of those colored mulches too, and I hate those! 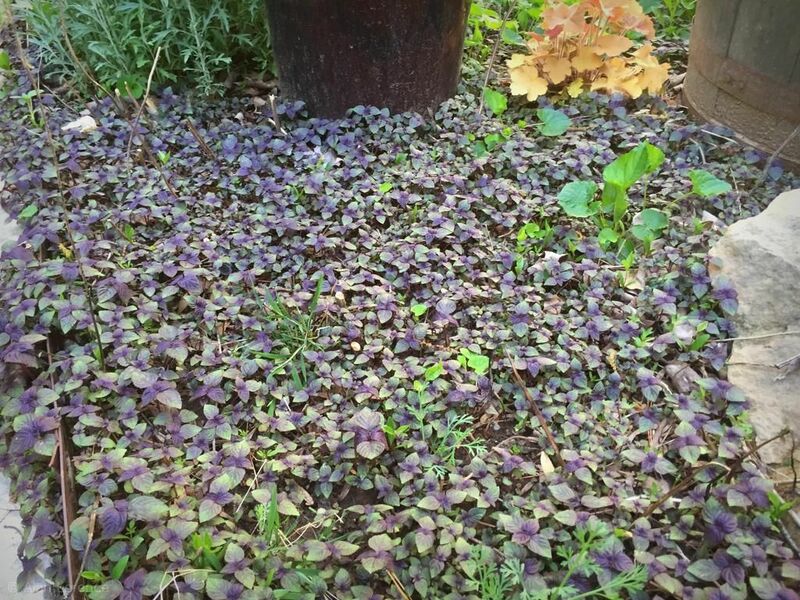 My mulch is... perilla (Perilla frutescens) seedlings! ...who are a mixed blessing. Yes, it's great seeing them swimming around the pond -- and on top of the house as in the case with this photo -- but they really tear things up there. It seemed like the female was feeding on fish eggs too, as they were spawning this week and she was filtering with her bill, poking it around the shallows where the fish were. I think I'll have to give them a few more months before I make a decision on whether or not I like having them here! 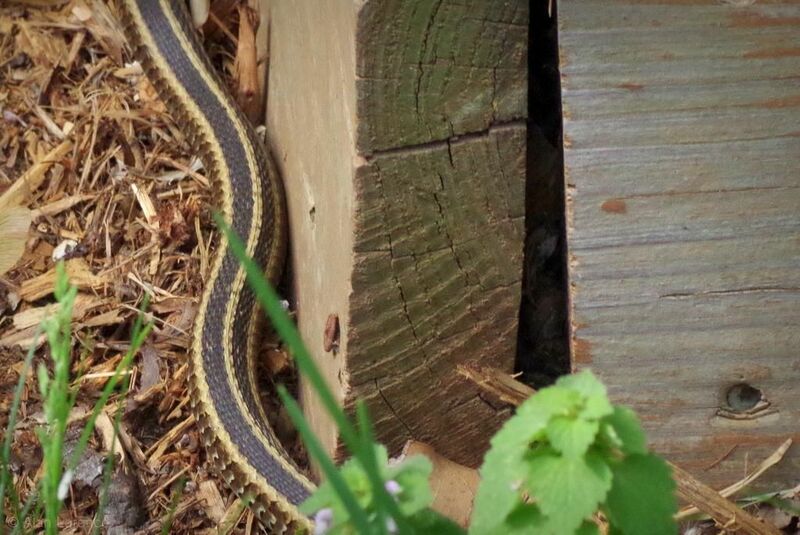 Seeing the garter snake in my garden the other day was just the start. I know that snakes are not everybody's favorite topic, but I think you might like today's short post. You see, I saw another snake yesterday. 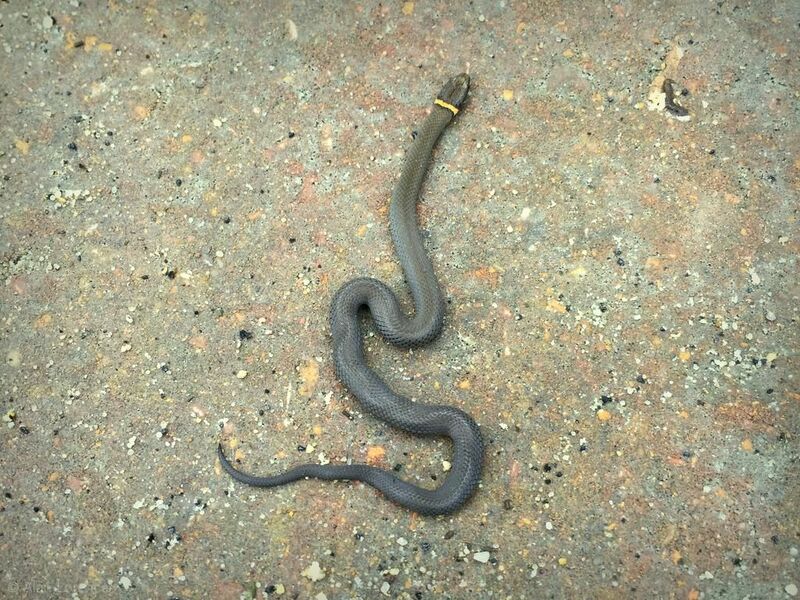 Actually I saw three of them, and they were a type I had never seen before: prairie ring-necked snakes (Diadophis punctatus arnyi)! Easy to see how this species got its common name, right? Snake! Snake! Snake! Snake! Snake! Snake! Snake! Snake! Snake! Snake! Snake! Snake! Snake! Snake! Snake! Snake! Snake! Snake! Snake! Snake! Snake! Snake! Snake! Snake! 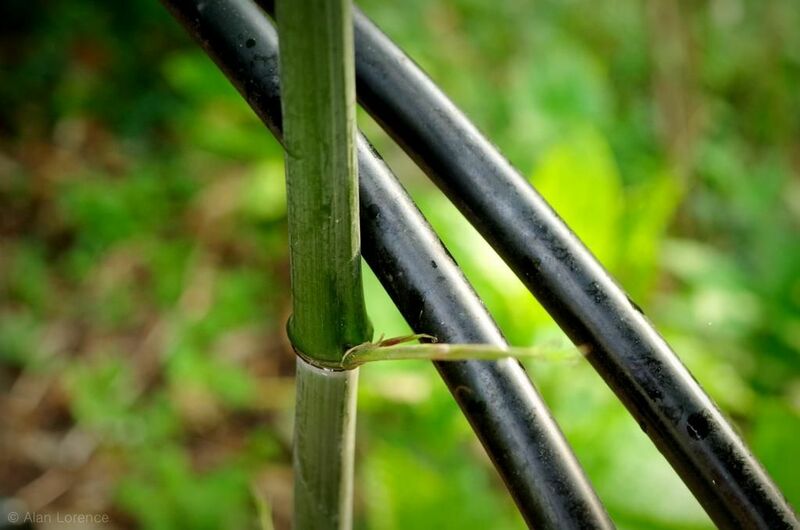 Hopefully that conveys the level of excitement I felt yesterday when I happened to glance out the kitchen window and saw something unexpected below, next to the bamboo box: Snake! Below the deck that is. More specifically, the view looking out of the basement doors that are beneath the deck. These doors face east so they give me the best morning view of the garden from inside. There's nothing better than backlighting to make certain plants pop, like these bleeding hearts. Love how the squirrel photobombed too, just jumped into the frame, froze for a second, then bounded off again. I've gotten most of the plants out of the garage now, as it's been an up-and-down spring but warmer weather seems to be here to stay. It was so warm a month ago that most of it was outside already, but had to be dragged back in again when the cold returned. I've already mentioned a few times that I will be buying fewer plants this year. In fact my goal is to buy none but that's just not possible, so I adjusted my goal to "less" plants. The same is going for plants that I grow from seed. 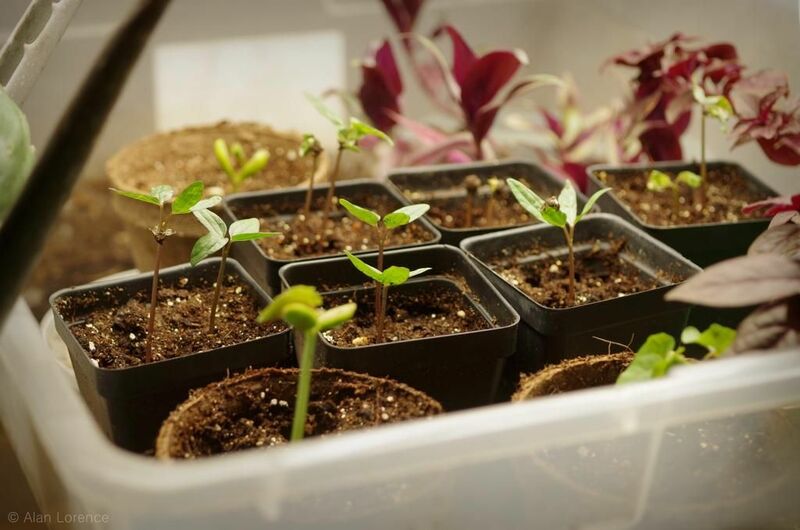 There were years when I would have dozens upon dozens of seedlings growing under lights indoors, waiting for the weather to stay warm so they could be moved into the garden. Not this year though. This is a long overdue book review. So tardy, but that's not a reflection of the book's content in any way! 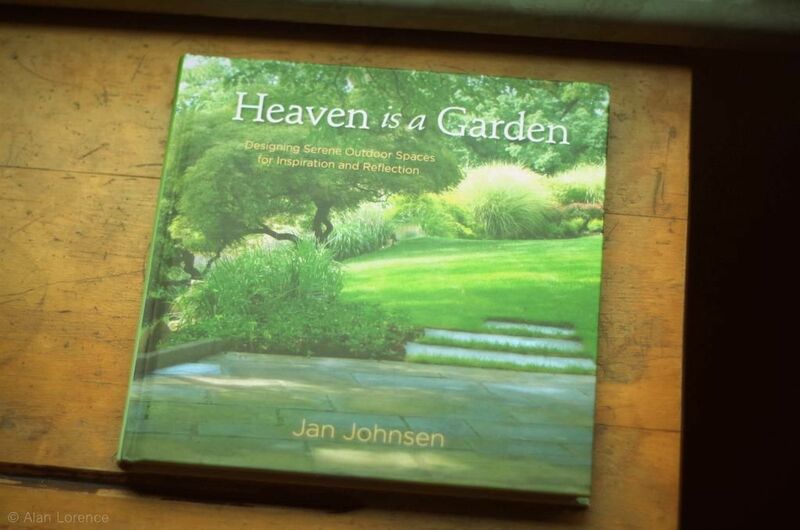 Heaven is a Garden is a design guide by Jan Johnsen (2014, St. Lynn's Press) whose tagline is "Designing Serene Outdoor Spaces for Inspiration and Reflection". Not being an overly spiritual person I was a bit put off by the title, but I'm all about "serene outdoor spaces" so I accepted a review copy from Jan.
My first act when getting a new gardening book is to quickly thumb through to get a feel for the content, a quick preview. Heaven is a Garden has everything to get me excited: rocks, trees, water, and enough photos to satisfy visually. 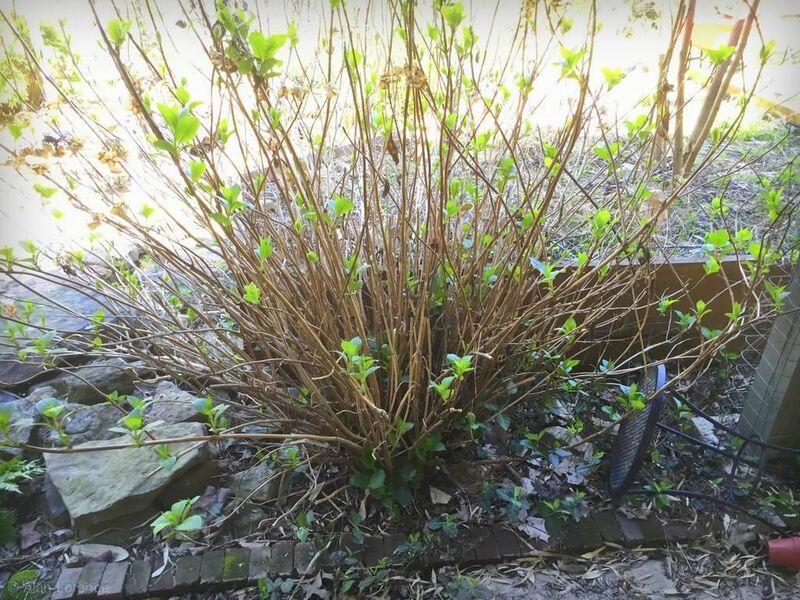 Is Friday becoming my day to scoop up the tidbits of the past week and press them into a coherent ball, a snowball of garden and plant observations? It seems that way. First up: pruning. This 'Lady in Red' hydrangea which I've shown you recently has gotten so large! 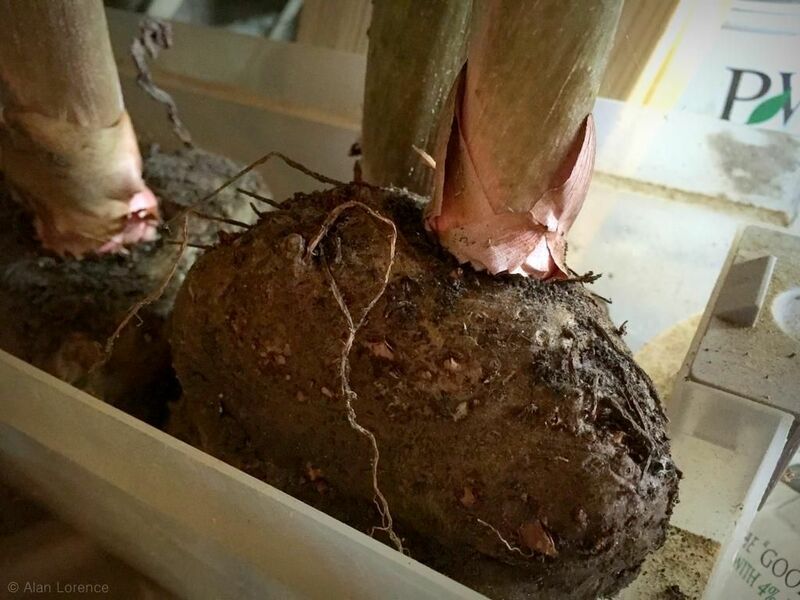 It's 18" (45cm) or more taller than its twin that was planted in the front of the house. Is it because it gets less light here, being half-shaded by the deck? 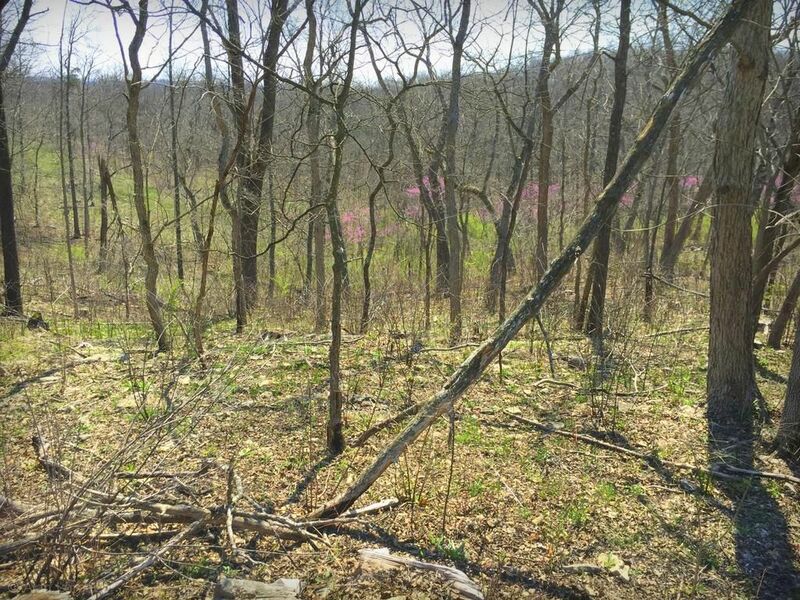 Shaw Nature Reserve is a sprawling natural area with many hiking trails not too far southwest of St. Louis. From my house it's pretty convenient, about 30 minutes away. My wife and I usually visit in April each year, and one or two other times during the year. 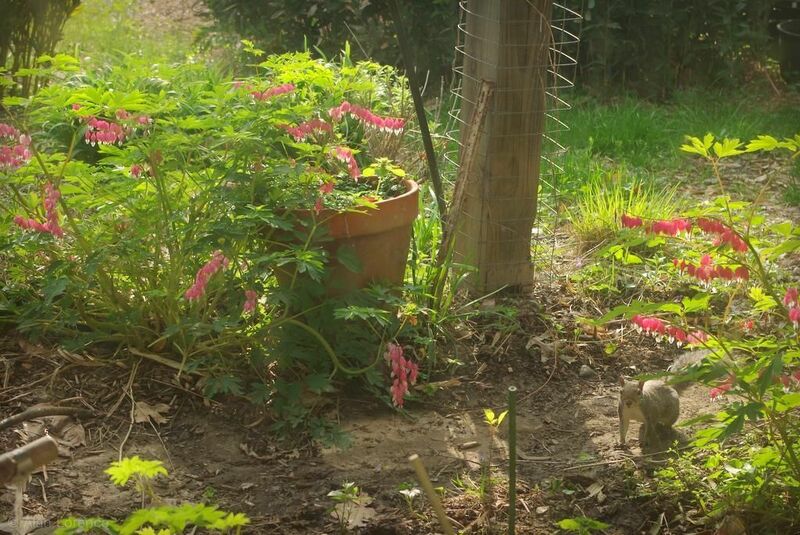 The other day I showed you some birds that are making spring in my garden exciting. Today there's more to share, starting with this hawk. 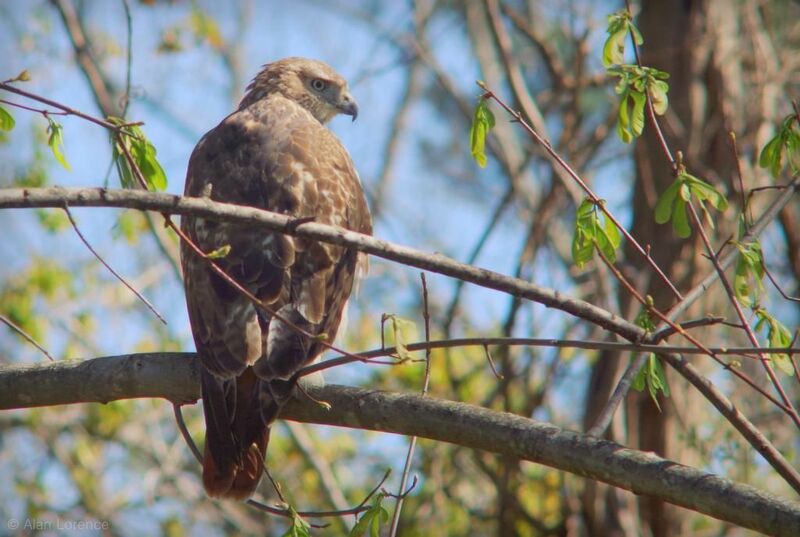 I'm pretty sure this is a red-tailed hawk, a juvenile who is not quite a year old. I was out at some of the local nurseries this past weekend (Greenscape Gardens, Sherwood's Forest, Wiethop Greenhouses) looking for some seed packets, and saw a few "interesting" things. Yes I saw loads of great plants, but the cool plants are not the focus of this post. I'll start with another weird thing seen at The Home Depot where I wasn't looking for plants. They always have something that makes me ask "why?" 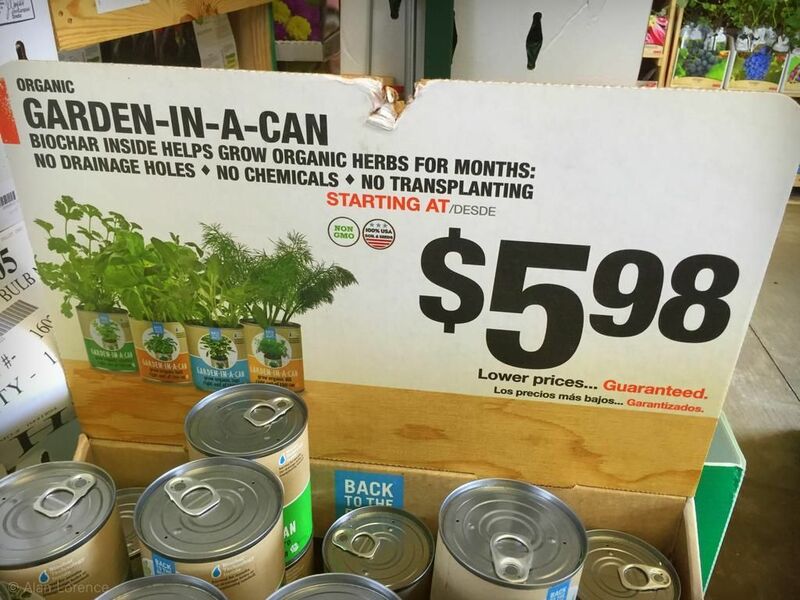 like the painted cactus, or the growable pods, and this was another to add to the list: plants in a can! After weeks of difficulty in finding worthwhile topics to post about in late winter, spring throws topics at me several times each day. 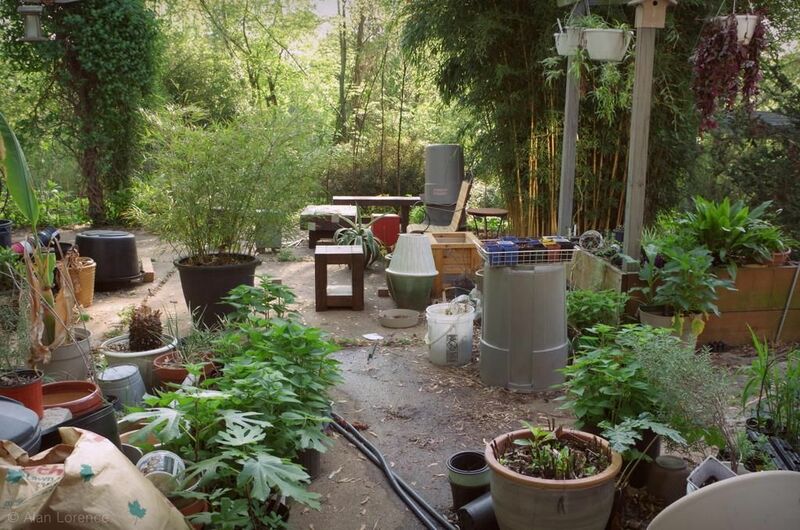 Nursery visits, outdoor adventures, emerging plants, springtime wildlife -- so much going on! So we'll start this week with photos taken last week after a rain. 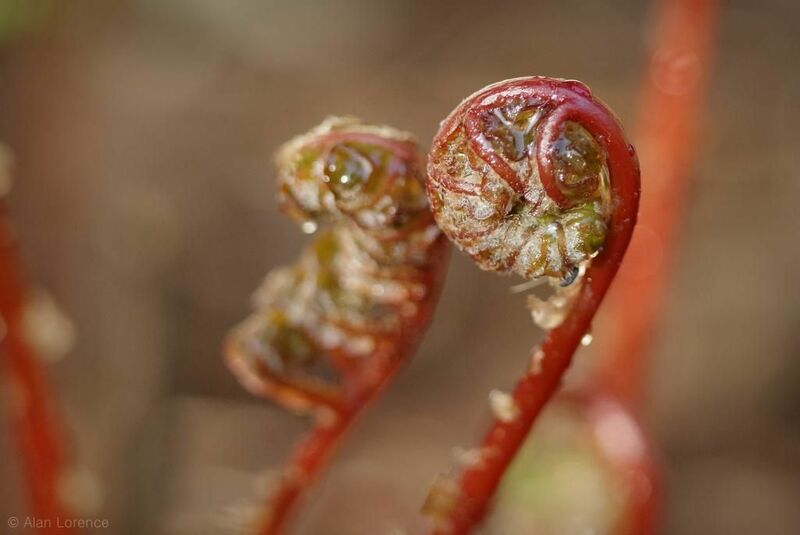 Everything was so moist and fresh, the lady fern fronds emerging especially so. I couldn't resist their fascinating forms! 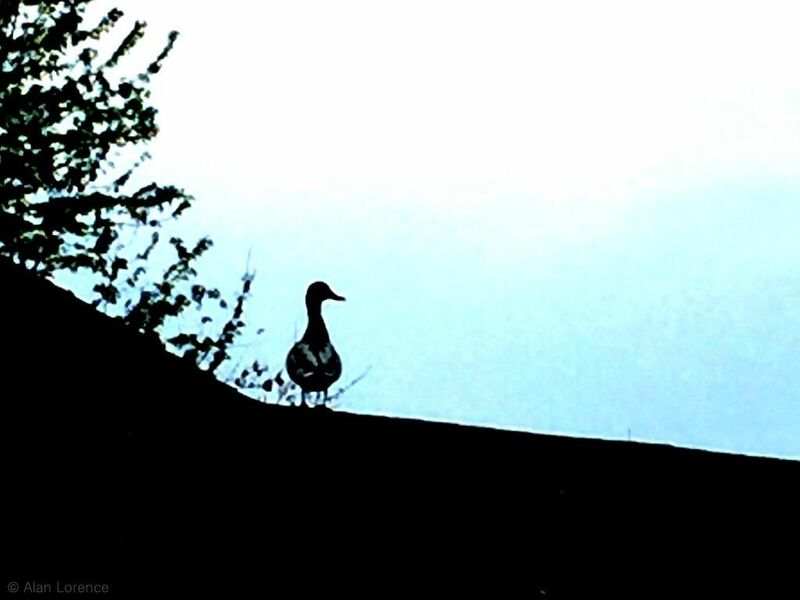 Birds are a big part of my garden. Without them things would seem lifeless and boring, so I'm always happy to see them anywhere. There are certain birds that are more exciting than others though, and I've seen a few recently. 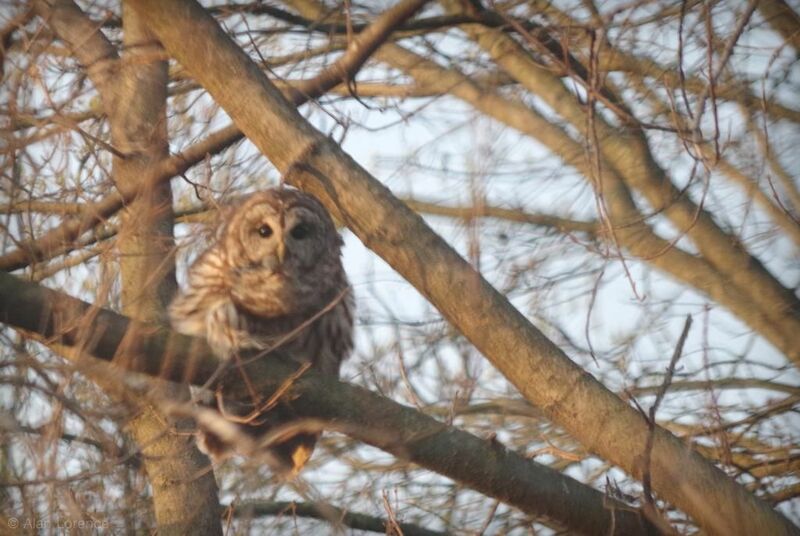 Starting with this barred owl. There are a few of these in the area so we hear them often, but seeing them "up close" in our yard is always a thrill!